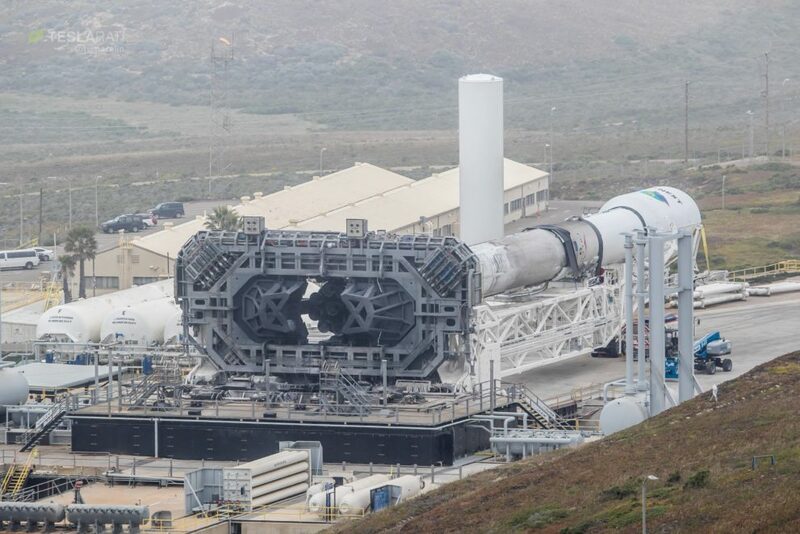 One of SpaceX’s rapidly shrinking fleet of older Falcon 9 launch vehicles has rolled out to the company’s California launch pad ahead of an expendable launch and fairing recovery attempt scheduled for no earlier than Tuesday (NET) 12:47 pm PST/19:47 UTC May 22. 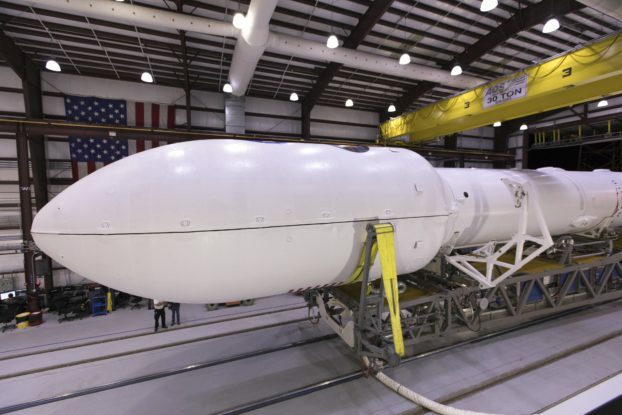 Although SpaceX may have inaugurated a new era of truly reusable rocketry with the debut of Falcon 9 Block 5 earlier this month, there are still a number of older Falcon 9 boosters (all flight-proven) awaiting their second and final flights. At the moment, a minimum of four cores remain, including the sooty Falcon 9 first stage captured earlier this evening by Teslarati photographer Pauline Acalin. 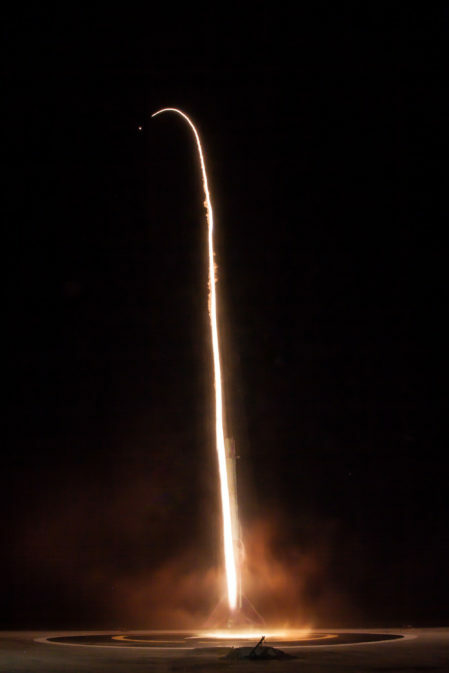 Foreshadowing its imminent watery demise with a lack of landing legs, this particular booster (B1043) previously launched the mysterious and controversial Zuma mission in January 2018, a classified payload claimed (sans convincing evidence) to have failed and reentered Earth’s atmosphere mere hours after reaching orbit. 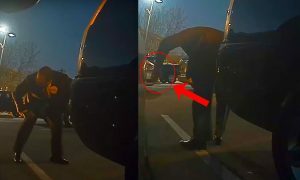 While it’s possible that the mission was a failure, at the moment unsteadily blamed on the failure of a Northrop Grumman-designed payload adapter and deployment mechanism, it’s far more probable that the apparently wildly-expensive satellite is still in orbit. 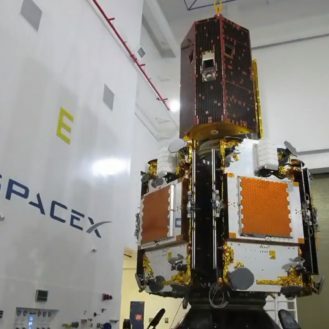 Regardless, the same SpaceX rocket booster responsible for lifting Zuma and the Falcon 9 upper stage out of the atmosphere is now ready to launch a new payload at SLC-4E, a launch pad stationed in Vandenberg Air Force Base. 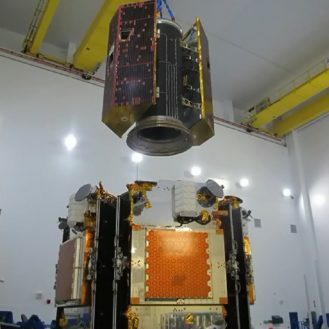 B1043’s second orbit-destined payload is a compliment of seven satellites: five are of the Iridium NEXT variety and the remaining satellites make up a scientific mission and technology demonstrator known as GRACE-FO (FO for Follow-On). Following in the footsteps of the original GRACE’s (Gravity Recovery and Climate Experiment) 15 year orbital tenure, GRACE-FO is effectively the same mission with significantly upgraded hardware – the biggest experimental component is actually an advanced laser interferometer designed to measure the distance between the two satellites (roughly equivalent to the distance between LA and San Diego) with the precision of a single micrometer (10-100x smaller than the width of a human hair). 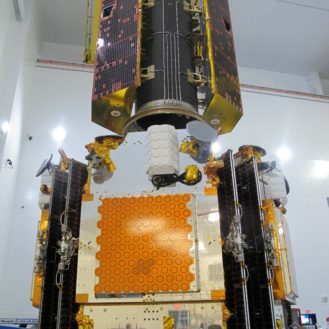 At that level of precision, the pair of satellites can detect minute changes in Earth’s gravity, to the extent that they can actually observe droughts, floods, and ice melt through the change in gravity caused by the movement of large (i.e. heavy) quantities of water. 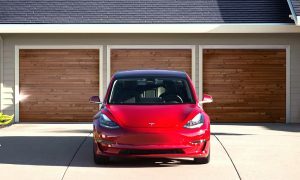 If the experimental laser ranging technology works as intended, it will be at least ten times more accurate than the microwave-ranging technology also installed on the follow-on satellites. 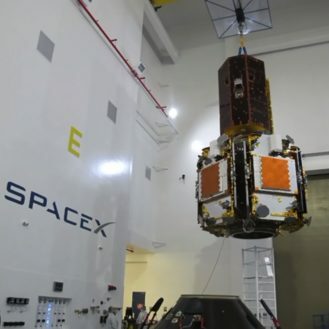 On the SpaceX side of things, Falcon 9 B1043 will be expended after dutifully completing the launch of Iridium-6/GRACE-FO, although the presence of grid fins on the rocket indicates that SpaceX will likely continue a regime of soft-landing recovery tests to optimize and flesh out the limits of Falcon 9’s capabilities. At first glance, the tradeoff of expending entire rocket boosters able to be (relatively inefficiently) refurbished for considerably more than two flights seems extreme and inadvisable. 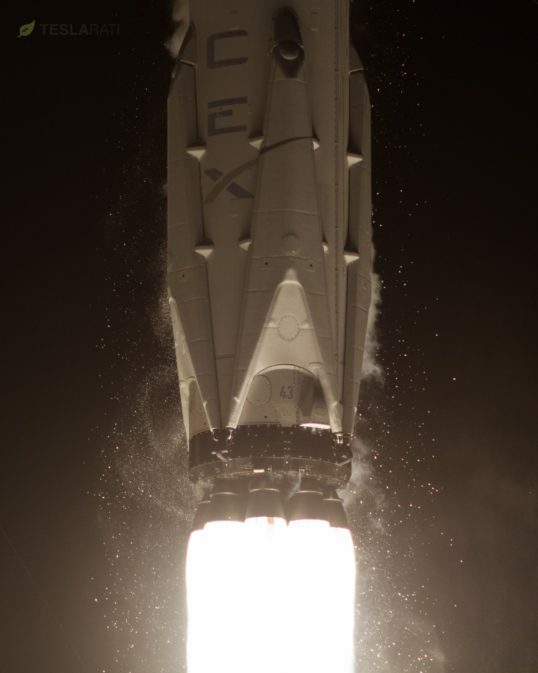 However, SpaceX is presumably ravenous for data on the survivable envelope of Falcon 9 performance – particularly reuse – in advance of the complete transition to the rocket’s Block 5 iteration, a significant upgrade likely to come hand in hand with a more pronounced aversion to expendable missions given each booster’s design lifespan of 10 to 100 missions. 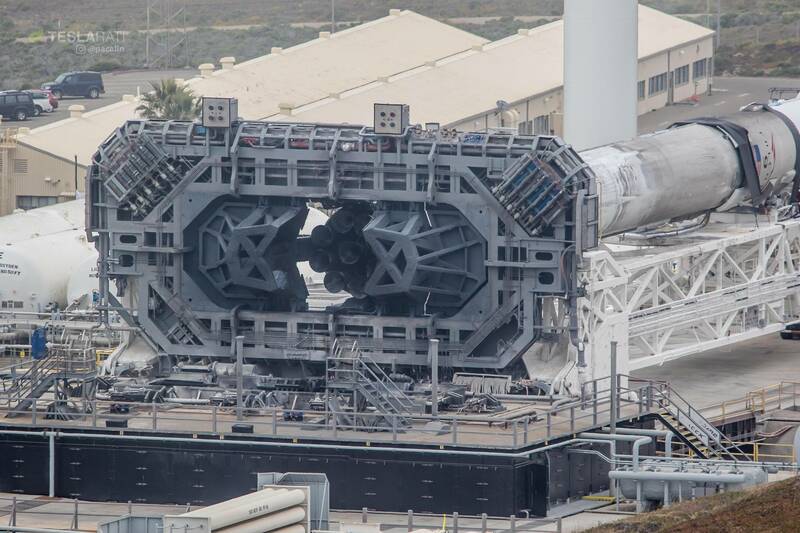 At that level of reusability, expending Falcon 9 Block 5s would truly become comparable with the absurdity of trashing an airliner after one or a handful of flights, an (in)famous talking point used by Elon Musk over his years of public SpaceX discussions. 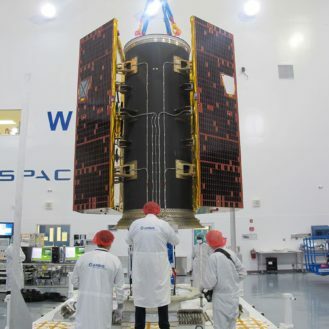 Thus, if SpaceX can gather data that might enable future Falcon 9 Block 5 recoveries by expending much less valuable Block 3 and 4 boosters, the payoff would be irresistible once examined with a long-term outlook. 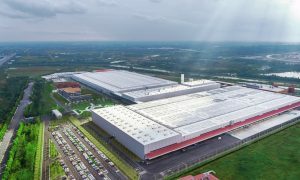 In the sense that Block 5 may be capable of magnitudes more flights with considerably cheaper refurbishment, the literal elemental value of the hardware – in the likely event that Block 5 production is more capital-intensive than Block 3/4 – is more or less irrelevant for an aversion to expending Block 5 boosters. 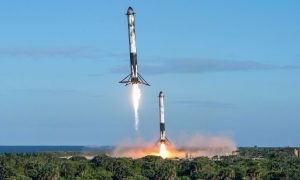 Rather, what is lost alongside an expendable Block 5 mission is instead the comparatively vast amount of revenue locked within dozens of additional highly-profitable launches each expended booster could have supported. 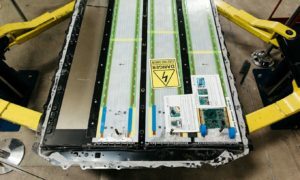 From that perspective, expending Block 3s and 4s to gather data might be accurately compared to destroying single-pilot Cessnas to improve the utility of a 747 airliner. After B1043 is expended, only three obvious flightworthy cores will remain outside of the gradually growing Falcon 9 Block 5 fleet (just two boosters, currently). In order of anticipated launch, these three missions are SES-12 (NET May 31), CRS-15 (NET June 28), and the Crew Dragon in-flight abort test (NET Q4 2018). Barring the unexpected refurbishment of an older flight-proven core for a third mission, these final three missions will bring to a close the inherently temporary era of partially-reusable SpaceX rockets – in the words of Elon Musk, Block 5 would thus signify that SpaceX has moved from “the dog that caught the bus” to, perhaps, the dog that caught the bus and then learned how to drive and maintain it. 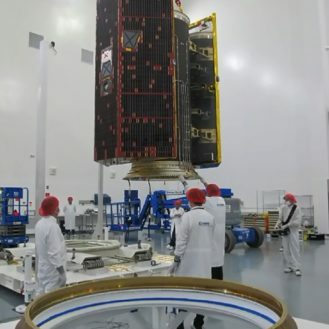 Somewhere in the middle of those final throes of old-guard Falcons will be an ever-increasing cadence of Block 5 launches and re-launches, likely including the first manifest-necessitated reuse of a Block 5 booster sometime this summer. 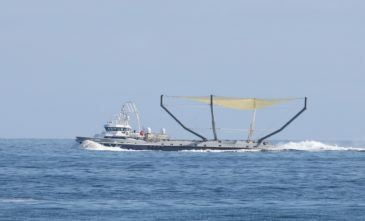 Meanwhile, despite the sealed fate of the rocket’s booster, tomorrow’s launch will debut fairing-catcher Mr Steven’s new and improved net. 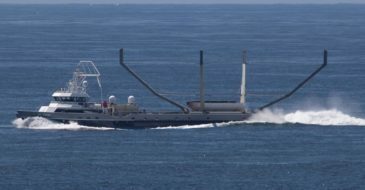 With the introduction of an upgraded net and what can only be described as back-to-back days of relentless ocean-going practice over the last two weeks, it’s entirely possible that Iridium-6/GRACE-FO will be able to lay claim to the first successful catch of a payload fairing following an orbital rocket launch. Fingers crossed. Follow the mission live on SpaceX’s webcast at 12:30 pm PST on Tuesday, May 22, and make sure to check back at Teslarati over the course of the week as photographer Pauline Acalin covers Mr Steven’s return to Port of San Pedro.